YogaFit changed my life in so many different ways. Within one year, I had lost 97 pounds and was a size 4. 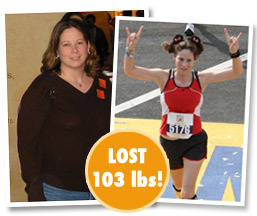 Now, April of 2008, I have lost a total of 103 pounds and wear a size 2/4. Not only have I lost the weight, but I also decreased my percentage of body fat from 33% to 16%. I have lost more than a total of 72 inches off of my combined body measurements. My waist is now smaller than what my thigh used to measure! I have completely changed my life in each and every aspect by combining a healthy, nutritiously balanced diet with regular (daily) exercise. I don't know what my life would be like now if I had not found YogaFit and YogaFit Master Trainer, Barbara Nobles. Seven or so years ago I joined a local gym to get in shape and lose weight. After a few months I began taking the yoga class offered there. I remember after my first class thinking "WOW, I am not sure what that was, but I really like it." I made yoga a key element to my workouts. I lost some weight then over time my weight began to go back up. Around this time our yoga teacher was moving and I was encouraged by the other students in the class that I should be the teacher. The teacher recommended YogaFit to me. I took YogaFit Levels 1 and 2 and began teaching in 2002. I was teaching as a plus size (size 14 at this time), and the students loved the class. I continued to look for more ways to learn about yoga and take and teach more yoga classes. I joined Weight Watchers to help educate myself more about food and portion sizes. I told my class that I was ready to really lose the extra weight, and felt that YogaFit was the key. 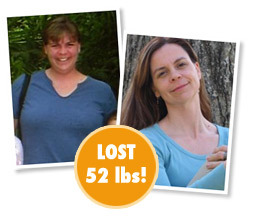 YogaFit was my safety net and over the course of the next year I lost 50+ pounds. I have maintained that weight loss for over 3 and 1/2 years with YogaFit as my main exercise. YogaFit helps keep me calm and in control, aware of what my body needs. Body Transformation: 45 pounds lost. At the encouragement of the fitness director at the gym where I was a member, I became a yoga instructor after taking the Level 1 training. That same weekend, I found out I was pregnant with my second child. After gaining 90 lbs with my daughter and losing 55 of those, I only gained 35 lbs with my second pregnancy with a regimen of yoga, Pilates, and aqua aerobics. My son was born in May of '05 and in September of '05, after a little delay due to a severely broken wrist, surgery, a metal implant and 2 months of physical therapy, I returned to teaching yoga weighing about 185-190 lbs. In February of '06, I became serious about losing weight. I began taking more trainings, more workshops, and teaching more classes. Over the past year and a half, I have gone from 185 lbs to 145 lbs. I would still like to lose about 10-15 more lbs, and I think yoga has and will continue to help me tremendously on my way to a fit, fabulous body. Four years ago I was 170 lbs, sad and felt like I was living in a cloud. My life changed because of the YogaFit program. I found the woman I knew was inside of me. The old me wanted to stay at home hiding from the world. This January at Disneyland with my children I found myself needing to get from one end of the park to the other with three 4 year olds fast! I put two in the double stroller and one on my shoulders and booked it across Fantasy and Frontier Land pushing and carrying an extra 90 lbs. of a niece, nephew and my son. YogaFit is the reason I could do that. I live every part of my physical life more fully because of YogaFit. I guess you could say Beth Shaw’s program helped me find my “beach body”. The cloud has lifted, and I love who I have become. I lost 30 lbs and went from a size 14 to a size 4! Thanks YogaFit! Body Transformation: 20 pounds lost. I gained 60 pounds with my first pregnancy, as a result of the chronic pain limiting my physical activity. I lived with severe, often debilitating pain that led to massive muscle spasms and skeletal misalignment. My P.T. told me that my spine had the rigidity of a 90 year old woman’s, I was only 26! During labor with my second child, three years later, the epidural failed due to my spine being so out of alignment. I struggled with weight gain and a lack of energy, asthma and frequent tendon injuries. I was literally a physical mess. I managed to get down to a size 10 at 150 pounds (by starving myself) but I had no muscle tone and no strength. I looked alright but felt terrible. Up until 26 months ago, I was a very sedentary, out of shape, in pain, stressed out mother of two sons, and two dogs. That was until I found fitness yoga classes at Lifetime Fitness. I feel absolutely wonderful! I don't get the huge muscle "knots" in my neck and my back is strong and very flexible. I am a very lean 130 pounds with 16% body fat, I'm in a size 4 (sometimes 2). My students say that I have a dancer’s body, and are amazed that I got so fit with YogaFit! My Yoga practice has evolved into my own mini rejuvenating break from reality. It’s become a way to balance volunteering at school, play dates, kids soccer and football games and all the other things that consumed my time and left me feeling a little drained. I often tell others that you can only give as much as you have, then you begin to feel empty. Yoga fills me up; it allows me to focus on myself. I am a yoga instructor teaching YogaFit. In the past 23 months I have lost 70 lbs. I have hypothyroid disease and when I am pregnant I can really pack on the pounds! After giving birth to my second child, I was 220 lbs. and only 5'5'' tall. Yikes! I lost the weight by not eating fast food, running an average of two times a week and most importantly doing Yogazfit at least 5 times a week. I had taken a few YogaFit classes and then in Feb. 2007, I took Level 1 in Orlando. This class motivated me & finally gave me the confidence to start teaching Yoga. By April, I had two private clients & landed a spot teaching at the new LA Fitness in Tampa. I lost 50 lbs. Prior to my YogaFit training & since February, I have dropped another 20 lbs. teaching YogaFit classes. Although I still have another 20 lbs. to go, I feel great and am in great shape. I feel so strong & healthy and I am enjoying teaching YogaFit to others! "She planted the idea of my becoming an instructor. What a positive influence in such a short time, (for me)! I positively and actively responded, taking chances that I never would have taken before." "Robyn was the first recipient of a Visionary Women In Fitness scholarship. "A Second Look" and the E! Style Network wants to sincerely thank you for this generous contribution." Autumn D., Producer, "A Second Look"
" You have created a perfect formula for the way I personally instruct my class. I wish there were more out there like your CD." "YogaFit has truly been a gift for me in my career." "Becoming certified to teach YogaFit was so beneficial to me both physically and emotionally that it excites me to be able to offer this experience to everyone I can!" "Thank you very much for offering this service to the world; it is truly a blessing." "YogaFit is one habit worth keeping." "We are extremely surprised how much we enjoyed the stress relieving benefits of YogaFit."